Blow, winds of change, blow! It’s not just the cold November air that’s taking our breath away these days. It’s the brisk winds of change heralding the dawn of a new administration and a new national commitment to address global warming, and to do so in a way that promises to stimulate a much needed economic recovery. This past Tuesday, President-elect Barack Obama made an extraordinary statement to the Governors' Global Climate Summit in Los Angeles, stating that his presidency “will mark a new chapter in America’s leadership on climate change that will strengthen our security and create millions of new jobs in the process” (watch the video here). Then today came the news that Representative Henry Waxman, co-author of the House Climate Change Principles and sponsor of the Safe Climate Act, had succeeded, through a secret ballot vote, in his bid to oust Congressman John Dingell from the chairmanship of the powerful House Energy and Commerce Committee. The first bill will establish a grant program to reduce global warming emissions under the Clean Air Act with up to $15 billion a year available to spur innovations in clean energy, including advanced biofuels. This will be an economic stimulus and follows President-elect Obama's recommendation. The second piece of legislation will direct the Environmental Protection Agency to set up a cap and trade system for greenhouse gases that meets the goals laid out by the President elect. This bill will reflect the strong partnership we will have with the new Administration, and will focus on achieving the emissions reductions needed while restoring the economy. It will be a streamlined bill, which will amend the Clean Air Act. She followed up her description of the two pieces of legislation by announcing that the first hearing in the 111th Congress will be entitled "How Fighting Global Warming is Good for the Economy and Will Create Jobs" and that it will take place some time in January. Then, Senator Boxer placed a cherry on top of the serving of well-received news by revealing that the Senate Environment and Public Works Committee will be represented by her top Committee staff next month at the United Nations Climate Change Conference in Poznan, Poland. Furthermore, she announced, Senator Klobuchar (D-MN) and potentially other Committee members will attend and report back to President-elect Obama and to the Committee. Now is the time to confront this [climate change] challenge once and for all. Delay is no longer an option. Denial is no longer an acceptable response. The stakes are too high. The consequences too serious. We are here to say that the Senate Environment and Public Works Committee will reach out to both sides of the aisle as we answer President-elect Obama's call. 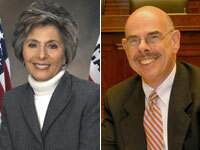 We here at 1Sky are cheering you all on, President-elect Obama, Congressman Waxman and Senator Boxer. It’s a new day and we’re glad to see it dawn.